I know what you’re thinking, “Another Penpal Program?” Yes, another. Why? Well first off because (A) I love getting mail. These days, I can go days without seeing anything in my mailbox. The bills that used to clutter my box now go directly to email, my magazine subscriptions have been canceled, to save money and paper (really, I read it all online, anyway), so nowadays getting a La Salle Alumni magazine is probably the highlight of my week. And (B), I love to bake. Duh. Last month, my Foodie Penpal, Christine, mentioned she was part of Bakin’ Friends. I immediately needed all the details. The program is similar to Foodie Penpals except instead of sending a box of good, you send a box of BAKED goods. Each month is pulled together with a secret ingredient. You bake for your assigned penpal (keeping in mind dietary restrictions of course), you receive from a different penpal and recipes and treats are shared all around. My sendee Bakin’ Friend, Desiree, ended up with Lemon Basil Sugar Cookies topped with royal icing and sprinkles. Other than the melting icing, they turned out beautiful. Recipe to follow in a few days. However, my sender, Aisha put my baking to shame. Our secret ingredient this month was SPRINKLES. I had the best intentions of making homemade sprinkles to go with my cookies, but an injury and heat got in my way. I had enough trouble getting the regular icing to set. But Aisha went for it. She baked up a beautiful batch of Italian Tea Cookies for me. They were rich, buttery and crumbled just enough. No lies, the whole box was gone in less than 24 hours. My husband and I couldn’t stop eating them! Whisk flour, baking powder and salt together in a bowl; set aside. In a large bowl, beat butter and sugar together on medium-high until pale and fluffy, about 2 minutes. Add egg, vanilla extract and orange extract, and beat until smooth. Add dry ingredients to the sugar mixture and beat until combined. Add sprinkles to the dough and gently stir to combine. Line baking sheet with parchment paper. Portion dough into 1-inch balls using 2 tablespoons of dough each. Place rounded balls about 2 inches apart on the parchment paper. Flour our lightly grease the bottom of a 1/4 measuring cup, then press each cookie into a flat disk. Refrigerate disks for 30 minutes. Preheat oven to 375°F. Bake one try of cookies at a time for 8-10 minutes, rotating halfway through. Cookies will appear slightly undercooked. Cool on wire rack and enjoy! Bakin’ Friends is all about connecting bakers, bloggers, foodies, and people who just like sweets! We’re in the business of baking and making friends! Each month we will be baking goodies, with a secret ingredient, to send out to one another. I’ll let you know at the beginning of the month what secret ingredient we’re using. It might be chocolate, it might be maple syrup, it may be bacon, whatever it is though you’ll be required to use it (unless there’s an allergy to the ingredient) in your baked goody. On the 6th of each month you will be paired up with a Bakin’ Friend. You’ll contact your newly appointed Bakin’ Friend to see if they have any allergies or dietary restrictions and you’ll also get their mailing address. Then you’ll bake your goody and have it in the mail and on its way to your new Bakin’ Friend by the 16th of each month. You’ll of course want to include the recipe for your baked goody so that your new friend can recreate the yummies at home! How cute would it be if we all did our recipes on vintage recipe cards, just sayin’! Are you ready to make some new friends? Then send an email to stephsbitebybite(at)gmail(dot)com with Bakin’ Friends in the subject. Emails MUST be received before the 4th of each month so that I have time to get all the match ups done. Please make sure to include your full name, your email address, your blog name and URL (if applicable), and whether you live in the US or Canada. I am so glad you joined the group!!! 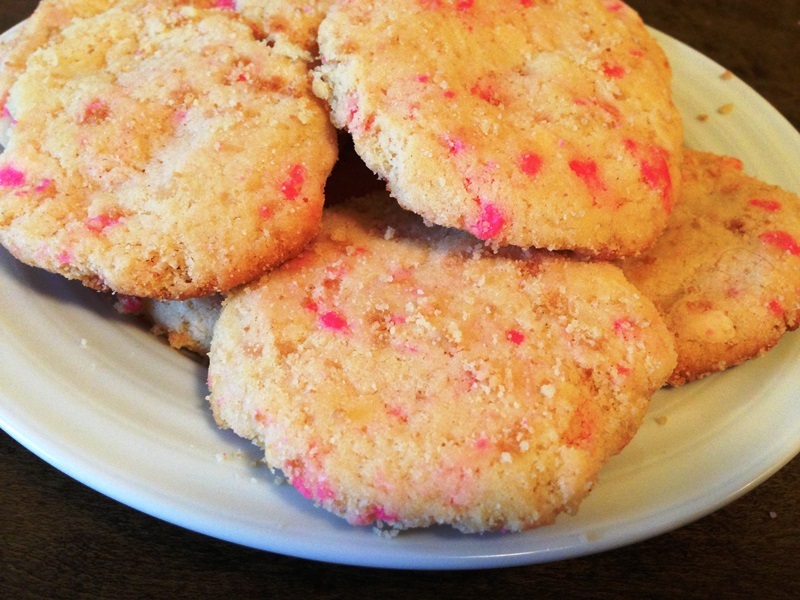 And I want a few of the pink sprinkle cookies to dunk in my milk glass!! There are a lot of great vegan baking blogs out there. If you’d like, I can point you to some of them since many of the blogs I follow are gluten free and vegan. I haven’t tried any vegan baking, but I know they often use “flax seed eggs” and coconut oil as the replacements for eggs and butter. Good luck! This is super fun! I don’t think I will have time in August or September since I have trips booked in the middle of both months but hopefully I can join in at some point. I love mail and sweets! Yeah I have a vacation planned in September so I might have to back out of that month. Starting in the fall isn’t a bad idea. Getting treats is great but baking in the heat isn’t much fun. Aww, I’m sorry. You should reach out to Steph at http://www.stephsbitebybite.com/. Find out how she does it and maybe you can start your own! Thanks so much Shashi for stopping by! And for the kind words. Bakin’ Friends is a great program. Small but it seems to be exciting a lot of people! What a fun idea, especially because you will get something SO yummy! 🙂 Happy SITS day! I know. How could anyone turn down baked goods?! Thanks so much for stopping by! That looks like a fun idea! My only problem is I am baking challenged! Enjoy your SITS Day! Thanks for stopping by. You could start small. Boxed cake or brownies and add some extra ingredients like fresh fruit or herbs, then go from there. I don’t believe in being baking challenged. As long as there’s love in the goods, they’ll be delicious! Thanks Julie. It does take a little time but so worth it. Only one month and I’ve met some great people. Plus who doesn’t like getting cookies in the mail?! I love penpal programs 🙂 If I was good at baking I’d definitely be signing up! Haha, I find that it challenges my skills. If I’m baking for me, it can be almost anything, but for someone else, I really need to make it perfect. Thanks so much Stacey for stopping by! Happy SITS day to you and sign me up to get food in the mail! YES! I am now following your blog! Have a wonderful day and enjoy! Thanks for stopping by Sandra. And for the follow. Can’t wait to see more of your blog too. Check out http://www.stephsbitebybite.com/ to sign up for Bakin’ Friends. Or there’s also Foodie Penpals with http://www.theleangreenbean.com/. Both programs are super fun. I think the 4th of the month is the cutoff dates. Hope you join! It really is. If you love to bake and get things other than bills in the mail, I highly suggest joining! Penpals with baked goods. What an amazing idea! I hope you’re enjoying your SITS day. You have an awesome blog. Have a blessed day! Thanks Vicki! Loving my SITS day. I feel like the center of the world. Not usually one for the spotlight but loving the feedback and friends I’m meeting! This sounds like such a really neat idea! And how fun to receive a surprise in the mail and get to enjoy something new and tasty. Too bad I’m a terrible baker! 🙂 I hope you have a wonderful SITS Day! Oh come on, you can’t be that bad! I find when I bake for others my stuff improves 10 fold. Must be the pressure. Thanks for stopping by! And those cookies sure do sound and look yummy! Thanks so much for stopping by. Yes, it has been a fabulous day and double yes to the yummy cookies! What a good idea. They look yummy. Happy SITS Day! I am so glad you posted this on your SITS Day, because I am so in on this!! Haha, it’s really a great program. I learned about it accidentally through another penpal program. Love it! Fantastic idea! Though everything looks so good, I would probably need “blackout days” so I didn’t gorge continually. See I reason that if I eat them all in one day, then I’m eating healthy the rest. Who cares if I have to consume a bazillion calories once a month. It’ll all balance. Yum ~ I love sprinkles! Those cookies look so yummy! So happy to have met you thru SITS. I’m having fun looking around your blog! Thanks so much for stopping by! Hope you like what you see! What a fun thing to participate in! I sort of want to join…but I am not the best baker or cook around. I will have to think about it. The cookies look divine. Those look so good! I did something similar this month but I don’t think i could afford the shipping every month. I feel like it evens out. What you’d spend to cook/send, they spend the same. The shipping was less than $10 and if you use the flatrate boxes, no need to worry about weight. What a great idea, penpals and baked goods a win, win. Happy SITS Day! Will have to check back soon. . .
And you meet some great people. I highly advise joining. Thanks so much for stopping by! Hi Christa–Thanks so much for stopping by. Bakin’ Friends is a great program. Really, who wouldn’t want cookies or other baked goods in the mail! Hope you liked what you see. Be sure to come back soon! This ssounds like so much fun! I like that you’re actually making thd foods and not just sending ingredients. I hope you had a wonderful SITS Day! Thanks! After the baking part, it’s quite a challenge to ship everything safely. I am late to the party but if there is room I would LOVE to join the group!! I’m sure there’s room! All the details are here: http://www.stephsbitebybite.com/bakin-friends/ Just email stephsbitebybite@gmail.com with the subject “Bakin’ Friends” including your full name, email, blog url and where you live (US or Canada). Pretty sure today is the deadline for joining in August so hurry!